The cows have been out in the back woods for a few days now and I was a bit concerned about their access to water. The tanks at the top of the hill by the barn were full and, while they can come back up to them to drink, there was no evidence that they had. I went down the first day to see where they were and make sure that they weren’t stuck somewhere. Everyone was fine and happily munching chest high in foliage. The next day I went back down and observed that they had relocated their bodies and their demeanor was the same. There was no interest in following me back to the top, not even for a drink. The third day I went down and there was no sign of them except a few cow pies. I went back up and got my husband, Thomas, and we headed back down in search of the now missing cows. He went one way and I headed out the other. Following the trail of fresh cow pies I wound around the bottom of the holler. I met back up with Thomas and we continued on the trail. At this point we have come across a couple of dogs and a few goats. No cows. The dogs however, have joined in the search and were quite happy to follow the cow pie trail. We saw many different ones and I explained to Thomas the difference between a fresh, hot on the trail pie versus ones that were one and two days old. As I got one of those” I can’t believe were having this conversation” looks, we kept walking. The dogs have figured out that we are looking for the cows and take off ahead. 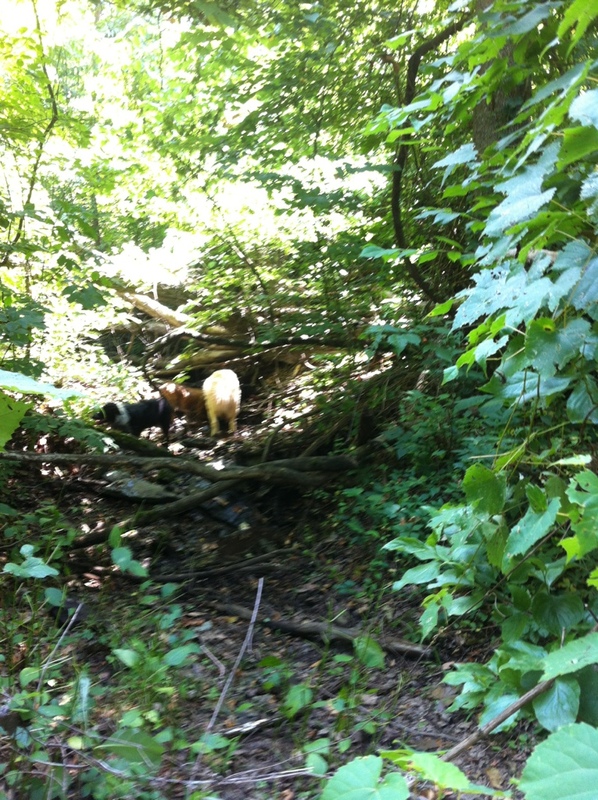 About twenty minutes later, tails wagging they are headed into a deep patch of brush. Thomas and I considered the tick factor and decided we trust the dogs judgement, decide the cows have been located, walked up a bit to see that the spring was coming up right about there and headed back to the house to put our feet up. The dogs didn’t care about the ticks and went for a dip in the spring. Good dogs.